A dry spread application fertiliser that has a balanced ratio of plant essential nutrients designed to suit all crops. Rapid granules dissolve quickly for a fast acting response. All nutrients required for plant growth are all in one granule. Nitrogen is present both as nitrate and ammonium. The readily available nitrate-nitrogen gives an immediate growth response, while the more slowly available ammonium-nitrogen ensures a long-lasting effect. Phosphorus is in a highly available soluble form, allowing ready uptake by plant roots and is essential for establishment and early development. Secondary nutrients and micronutrients are present, with amounts tailored to horticultural production, with emphasis on calcium, sulphur, magnesium, zinc and boron. The specific ratio of nutrients in Rapid is formulated to meet the complete nutritional needs of a vast range of horticultural crops. Campbells Rapid has a low salt index and hence minimises the potential for fertiliser scorch. It is near neutral in its effect on soil pH, which helps maintain a productive soil environment. 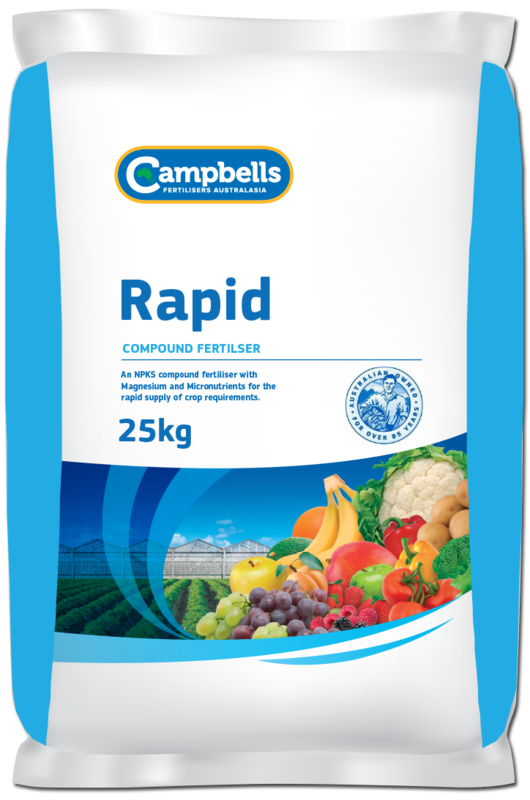 Campbells Rapid is a true compound fertiliser, not simply a mixture of different fertilisers pressed into a granular form (a granulated blend) or different fertilisers physically mixed together (a blended fertiliser). The consistent granule size range allows uniform application with no separation of nutrients. Campbells Rapid is ideal as a base or top dressing. It is a non-dusting, free flowing product that can be applied as a band or broadcast or can be incorporated into the soil or growing medium prior to planting. General rates for horticultural crops are between 150 to 600 kg/ha. The actual rates, number of applications and their timing will vary considerably for different crops and for different districts. Before application, seek advice from your Campbell’s Rapid distributor or your local agronomist.